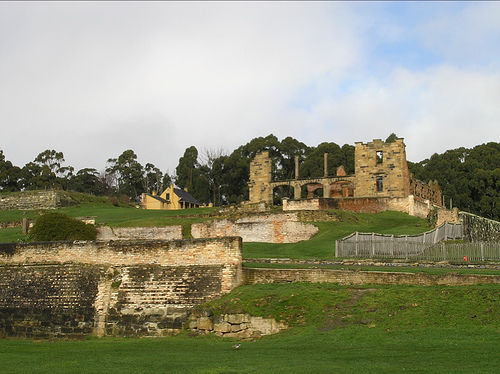 Port Arthur Tasmania is the state's greatest historical destination. The old convict settlement of Port Arthur is one of the most interesting places to visit not only in Tasmania but in the whole Australia. It is much more than ruins of a convict prison – it’s a whole town full of convict history. Between 1830 and 1877, 12,500 convicts served their time here. Port Arthur's convicts were the worst of Australian convicts - they were the ones that after having been sent to Australia continued committing crimes. Port Arthur was a good place for such bad criminals because it is connected to the rest of Tasmania only by Eaglehawk Neck - a strip of land less than 100m wide. The narrowest passage along the Eaglehawk Neck was lined by ferocious guard dogs and the waters around it were full of sharks so it wasn't easy to escape. When the convicts first arrived, they built huts and barracks for the guards and for themselves for protection from weather while the rest of the town was built. There are no remains of these huts today except some old fragments buried under the soil, which occasionally have been dug out later. Soon after the establishment the convicts built the Commandant’s Cottage with nice gardens and a magnificent views over the water. Next to it they built the Guard Tower, which was ready in 1836. The Port Arthur Church was ready in 1837, with enough room to hold 1000 convicts and 200 guards, and it continued to operate until 1884 (years after the convict colony had closed) when it was destroyed by a fire. In 1842 the hospital was ready, a sign of a fairly humane treatment of convicts at the time, but possibly only a result of the guardians’ fear for a disease to break out and kill themselves too. There are only ruins left from the hospital today, but in its days it accommodated up to 80 sick prisoners. The main prison, called Port Arthur Penitentiary, was ready in 1844. Located right on the waterfront, this 75m long four-storey building was at the time the largest building in Australia. It had 136 single cells but most of the prisoners lived in large dormitories housing 513 prisoners. Although all the timber in the building burned up in a fire in 1897, you can still see a lot of details and imagine a life in a 135cm long cell. A few years after finishing the Port Arthur Penitentiary, in 1848, the Model Prison was built. It had cells to separate prisoners from each other, reflecting the new trend of building prisons in England - based on the thought that silence would be the cruellest form of punishment, and that separation from others would make the prisoners to think about their crimes. They were called by numbers instead of names, and they had to wear head masks while in the exercise yard. They were not allowed to talk to each other at any time, and while in the church they were separated in different boxes. With that sort of treatment it is not to wonder that a mental hospital was soon needed, and Asylum was built to house mentally ill patients. It was the last major building, built as late as in 1867, only 10 years before the penal colony was closed. You can see today that Asylum is more modern than the other buildings in town. Only months after the establishment of Port Arthur in 1831, the island of Opossum became a burial ground of the settlement, and it was named the Isle of the Dead. 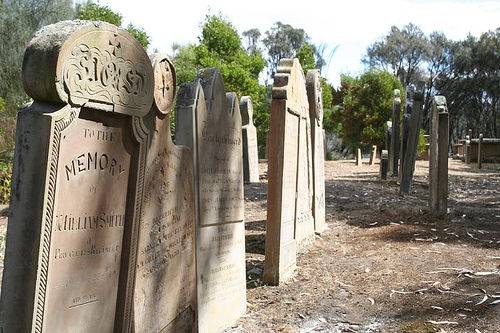 The settlers and convicts had separate cemeteries and there was a plan to leave the convicts’ graves unmarked, but some of the convict tombs do have headstones. 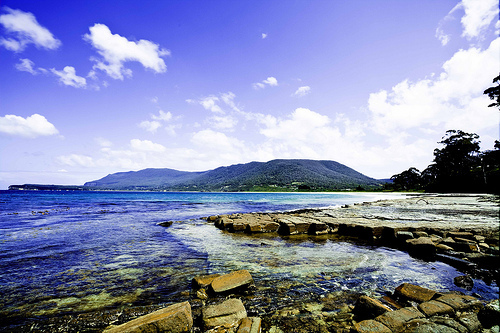 A ferry trip to the island definitely adds to your Port Arthur experience. It is not easy to imagine what the life was like in Port Arthur. You can join historical guided tours that give you an insight into what a self-sufficient settlement it was with convicts making shoes and clothing, growing vegetables, building ships and processing timber. 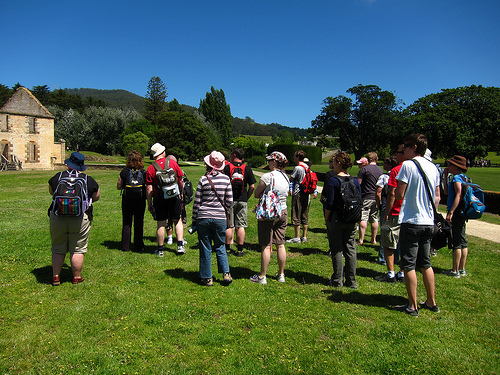 You can also join tours that take you here from Hobart. There are a few eateries such as Felons, Phudies and Convict Kitchen Bistro. Would you like to stay over the night, nowadays there are plenty of accommodation at Best Western Fox and Hounds Inn, Best Western Lufra Hotel, Burilda Waters Holiday Home, Casilda House B&B, Classic Cottages, Comfort Inn, Drover's Daughter B&B, Eaglehawk Hideaway B&B, Parsons Bay Lodge, Parsons Bay Retreat Hotel, Rocking Horse Apartments, Sea Change Safety Cove B&B, Stewarts Bay Lodge and Storm Bay Guesthouse. On the way to Port Arthur there are a few interesting rock formations, and the Tasman National Park. Nearby is also the Tasmanian Devil Park where you can watch Tasmanian Devils, kangaroos, birds of prey and other Australian animals. Here's a Port Arthur map, where I have tagged the places that I mentioned on this web page. You can click on the tags to see what places they are, and double-click anywhere on the map to zoom it in and see the places closer. Drag the map to move around, and if you want to see the satellite image with Google Earth, click on "Sat" in the top right hand corner. Had some good time in Port Arthur?